Do you hate wearing shorts? They’re definitely not the attire choice for everyone and thankfully, there are many stylish and comfortable outfit ideas of the non-shorts variety. When it comes to summer outfit ideas, shorts are last on my list. It’s usually because my legs aren’t exactly my favorite feature or I can’t find a pair that fit me comfortably. 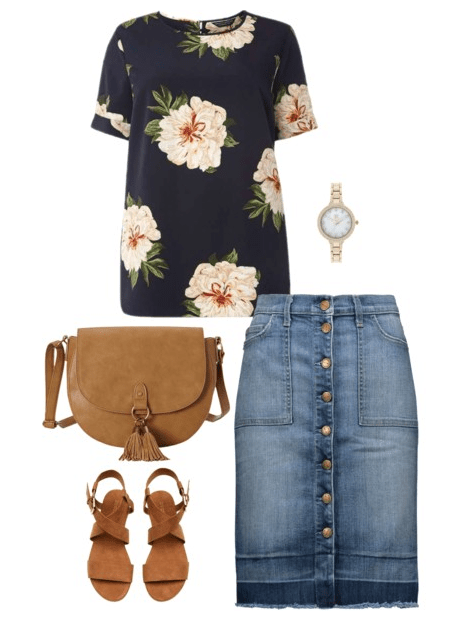 I did recently find a pair of denim shorts I like and created several different denim shorts outfits, but other than those, I am all about those non-shorts outfits. If you’re looking for some alternatives to shorts in the summer, I think you’ll love the following outfit ideas. When you find a maxi dress you love and it fits you just right, hold on to it! There are so many different combinations to dress up or down a maxi dress. 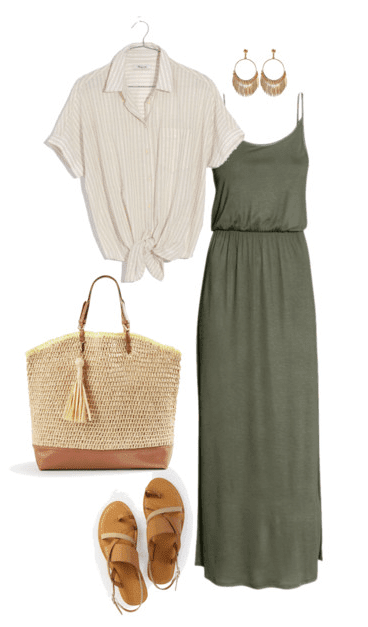 Putting together maxi dress outfits can be fun and help you get the most out of your summer wardrobe. Wearing a maxi dress with a denim jacket is always a great choice, but if the summer heat is beating down on you, you might want to opt for something a little lighter in weight. The perfect alternative to a denim jacket is a tie front shirt. It’s such a cute look and great for summer get-togethers. This maxi dress is from H&M and only $19.99, plus it comes in both black and olive. The tie front shirt is from Madewell and is slightly oversized for a slouchy fit. Meaning, it’s incredibly comfortable! If the price is a little much for you at $69.50, Gap has some cute tie front shirts as well. The great thing about shopping at Gap is the likelihood of them having a sale is very good. 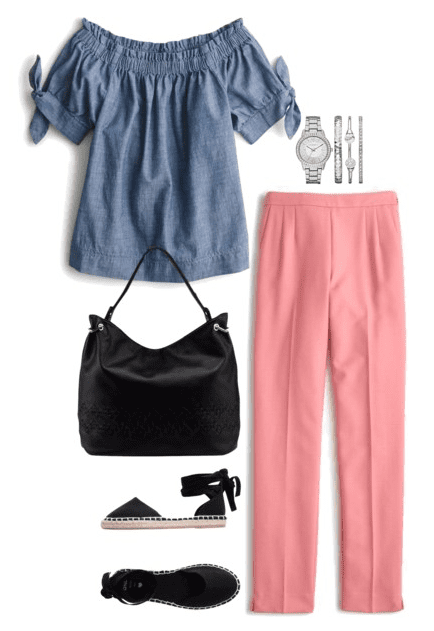 The straw tote is from Ann Taylor and although it’s $98, they often have 40% off sales. The sandals are from SheIn and have great reviews. One shopper said the soles are very padded and the sandal fit comfortably and snuggly. 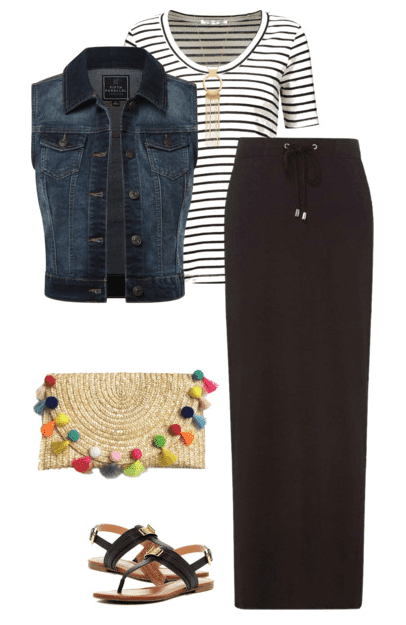 If you like maxi skirts, then you’ll love this simple, classic and oh so comfortable outfit idea. A black maxi skirt is a great piece to have in your wardrobe because there is so much you can do with it. One of my favorite outfit ideas is pairing it with a t-shirt and vest or denim jacket. The maxi skirt pictured above is from Dorthy Perkins and features a tie waist. I love that design for the looks and the practical aspect. I’ve definitely bought elastic waist maxi skirts in the past that were uncomfortable and didn’t fit well. The tie waist lets you adjust it to fit your size waist just right. I recently added a striped t-shirt to my wardrobe and have been wearing it non-stop. (Exhibit A.) I purchased mine from Target on sale for $5 and have been very happy with it! The one featured in the outfit above is from The OutNet, an online store which slashes prices. Since the summers can be a little hot for a denim jacket, a denim vest is a great alternative. Plus you can wear it with jeans, shorts, and dresses. The straw pom pom clutch is a best seller and sells out fast. I can see why! It adds a punch of color to your outfit and gives it some personality. I know white jeans aren’t for everyone, but if you enjoy wearing them, they’re a great alternative to shorts. If stains are a concern for you, try Old Navy’s Stay White denim that repels stains and spills. 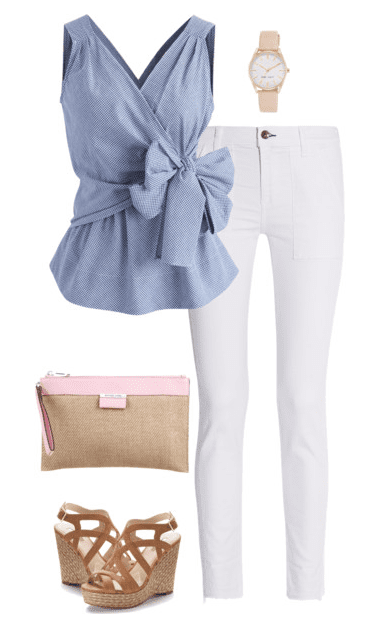 I put together the white jeans outfit above, plus several others here for a feature last week. I’ve had quite a few question about the bow shirt above. It’s a gingham wrap top from Chic Wish and is selling out fast! A favorite summer look of mine is a pair of colored cropped pants and a cute top. Cropped pants can be dressy for work or your go-to pants for the weekend. The pants in the outfit above come in a bunch of colors and are currently on sale. I also used to wear capris quite a bit and then stopped, but I added a pair from Prana to my wardrobe and am pretty sure I’ll be living them all summer long. Check back soon for a fashion feature with the pants and a top from Prana. It seems women either love or hate off the shoulder tops. The one featured above is from J.Crew and I’ve seen it worn both off and on the shoulder. Usually, you can find tops that can be worn both ways. The shoes are from Yoox and are $34. If shorts aren’t your thing, a knee length denim skirt and knee length skirts in general are a perfect alternative. Pair it with a cute top, some sandals and your favorite handbag for a stylish weekend or everyday outfit. I hope those of you who never wear shorts or were just looking for some outfit alternatives to shorts in the summer found these outfit ideas helpful. Shorts are not a summer essential! But being comforable and feeling great in your clothes is.